...to ensure the best student outcomes. WHAT IS THE MOMENTUM CAMPAIGN? The Momentum Campaign is a comprehensive fundraising initiative to attract, retain and inspire teachers… to ensure the best student outcomes. St. Luke’s is currently in the fourth and final phase of the larger overarching $75.5M Momentum Campaign, which was launched in 2007 and will close in 2020 with the successful completion of Phase IV﻿. 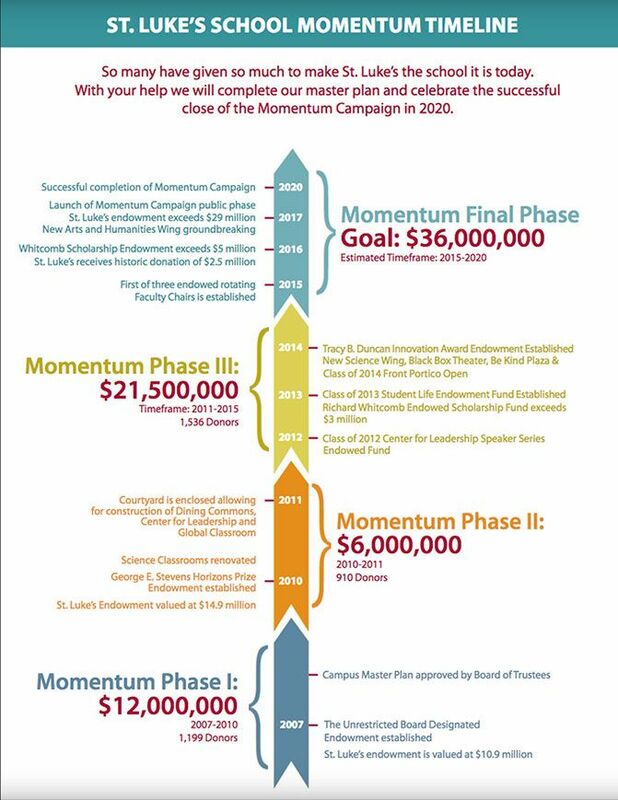 Phase I of the Momentum Campaign (2007-2010) established the Board-Designated Quasi-Endowment and increased St. Luke’s overall endowment from $10.9M to $14.9M. Phase II of the Momentum Campaign (2010-2011) enclosed the courtyard, built the Dining and Fireplace Commons, the Center for Leadership and the Christine Noyer Seaver Global Classroom. The middle school classrooms were renovated. The George E. Stevens Horizons Prize Endowment was also established. Phase III of the Momentum Campaign (2011-2015) built the New Science Wing, Black Box Theater, Be Kind Plaza and Class of 2014 Front Portico. The Class of 2012 Center for Leadership Speaker Series Endowment was established, as was the Class of 2013 Student Life Endowment, and the Tracy B. Duncan Innovation Award Endowment. This final phase of the Momentum Campaign (2015-2020) focuses on investing in teachers, and includes facilities($15M), endowment ($12M) and Annual Fund ($9M) components. WHAT DO YOU MEAN BY “COMPREHENSIVE” CAMPAIGN? A comprehensive campaign is an all-inclusive fundraising effort, encompassing Annual Fund, Senior Gift, facilities and endowment initiatives. Donors may make a pledge to St. Luke’s that includes support for all or some of the School’s fundraising initiatives. Our purpose in conducting a comprehensive campaign is to create the opportunity to have a meaningful conversation with as many families in our community as possible and to work with you on a personal level to plan your giving to St. Luke’s. While schools often think of individual fundraising initiatives as being separate and apart from each other, St. Luke’s has come to understand that many of our donors view their giving to St. Luke’s in the aggregate. The Momentum Committee hopes that this all-inclusive approach to fundraising will make giving to St. Luke’s easier and more rewarding for our donors. WHAT WAS THE PROCESS FOR DETERMINING THE STRATEGIC PRIORITIES FOR THE FINAL PHASE OF THE MOMENTUM CAMPAIGN? The St. Luke’s Board of Trustees charged the Momentum Committee with envisioning the St. Luke’s of 2020 and beyond. Through extensive conversations with faculty, staff, alumni, and parents, it quickly became apparent to the Momentum Committee members that the St. Luke’s community places an incredible amount of value on our faculty. To invest in our faculty, we needed to understand what matters most to them. What do they value? What brings deep professional satisfaction? What enables them to be exceptional teachers? The answers to those questions are the strategic priorities of the final phase of the Momentum Campaign. WHAT ARE THE CAMPAIGN’S STRATEGIC PRIORITIES? Our future depends on our ability to attract, retain, and inspire exceptional teachers who have a passion for teaching and are deeply about students. 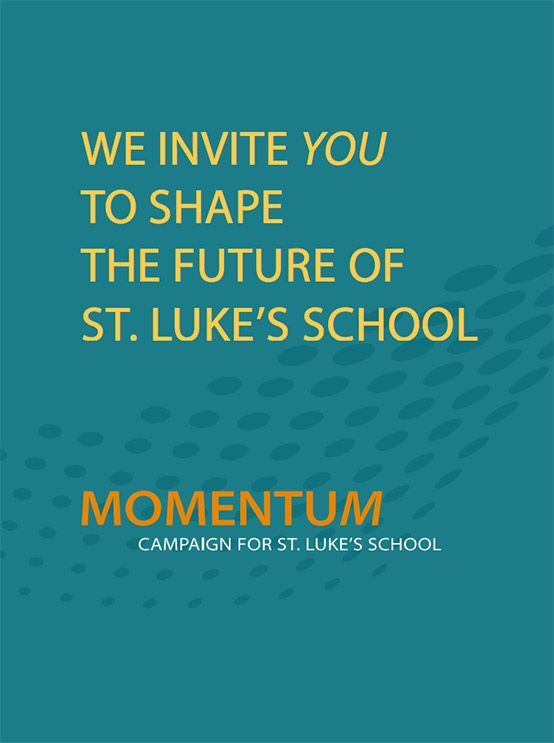 By investing in our teachers, the Momentum Campaign will ensure that St. Luke’s students will benefit from a forward-thinking faculty within a dynamic learning environment. Our goal is to attract, retain, and inspire exceptional teachers… to ensure the best student outcomes. We will accomplish this through two paths: Growth & Recognition and Environment. WHAT DO YOU MEAN WHEN YOU REFER TO “GROWTH & RECOGNITION”? Teachers thrive when they feel valued and respected. Like their students, they crave the opportunity explore and grow. By providing them with resources, opportunities, and encouragement to develop, they will be empowered to bring their best to each moment of teaching. This fund will be a tool to strategically retain top faculty, encourage growth of subject expertise and cultivate teaching and learning at St. Luke’s. These Chairs will serve as St. Luke’s highest academic faculty award, recognizing diverse talent and providing stipends for honorees. The Annual Fund (accounting for 8% of the operating budget) drives the St. Luke’s experience by supporting daily life for students and faculty, bolstering salaries & benefits, and funding professional development opportunities. WHAT DO YOU MEAN WHEN YOU REFER TO THE ST. LUKE’S “ENVIRONMENT”? Great teaching and learning happen in an environment that suits learning goals. In this final phase of the momentum campaign, St. Luke’s will expand the main academic building, breathing energy and new possibilities for learning into the humanities, visual arts, the library and designLab. We are cognizant that environment includes more than just physical spaces. It encompasess emotional well-being of those who work and interact at St. Luke’s, and who feel the impact of working in a diverse and compassionate community. The new addition will bring an expanded visual arts program back to the main academic building, reinvent our library, enlarge the Fab(rication) Lab and build light bright collaborative spaces for Upper School history and English departments. This quasi-endowment ensures competitive salaries & benefits and enables the St. Luke’s Board of Trustees to respond flexibly to faculty and program needs as they arise. The scholarship honors and carries forward the legacy of beloved Headmaster Emeritus, Richard Whitcomb by providing financial support for talented students and helping to ensure a diverse student body at St. Luke’s. HOW DOES FINANCIAL AID FIT INTO THE PICTURE? Currently, 16% of our students receive some level of financial assistance. Under Mark Davis’ leadership, total aid awarded has increased from $977,000 in 2002-03 to a budget of $3.3M for 2017-18. The number of students receiving aid has grown from 57 to 92 during that same timeframe. We continue to raise funds to support our scholarship programs. Some of these funds are supported through endowment, such as the Whitcomb Endowed Scholarship Fund, while other scholarships are funded on an annual basis. As part of this campaign, we aim to grow the corpus of the Whitcomb Endowment by an additional $1.5M (to a total fund of $5M) and fundraise for annual financial assistance gifts as part of the Annual Fund goal. IS ADDITIONAL PARKING PART OF THIS CAMPAIGN? Parking enhancements are currently being investigated and will be included in future fundraising initiatives. WHAT IS ST. LUKE'S BUILDING? St. Luke’s current construction project will add ten classrooms, both in the Humanities Wing and the Library spaces, as well as a reimagined Library, a Library Cafe and 4 stories of Art space. The lowest level of the building will house a state-of-the-art Fab(rication) lab. The new facilities will be flexible and adaptable spaces for teaching and learning ideal for a variety of teaching styles including Harkness methodologies as well as hands-on and project-based learning. In total, this construction project will add 26,000 sq. ft. of new space and will renovate 12,000 sq. ft. of existing spaces. While the new humanities classrooms will serve Upper School History and English classes, the Art classrooms, Library, Fab Lab and Lounge will serve both Middle and Upper School students. This is the biggest construction project in the school’s history and when completed, will mark the successful close of the master facilities plan, developed in 2007. HOW MUCH DOES IT COST AND HOW ARE WE PAYING FOR IT? The building project is projected to cost $18M and it will be financed primarily through fundraising. The Board of Trustees has thoughtfully worked with a financing partner to ensure that St. Luke’s is in a fiscally sound position to move forward with the project while continuing to fundraise. For more information or to make a donation to this project, please contact Director of Development Ninette Enrique at enriquen@stlukesct.org or 203-801-4857. WHAT IS THE MASTER FACILITIES PLAN? HOW WILL THIS CONSTRUCTION PROJECT IMPACT PARKING? The construction project will have minimal impact on parking. Seniors will continue to have parking privileges on campus for the 2017-2018 school year. During construction, there will be a temporary lot on the Upper Field where construction vehicles and approximately 30 faculty members will park. The new wings are scheduled to open for the start of the 2018-19 school year. HOW WILL ST. LUKE'S ATHLETICS PROGRAM MANAGE WITHOUT THE USE OF THE UPPER FIELD DURING THIS PROJECT? During construction, the Upper Field, home to St. Luke’s softball and field hockey programs, will be used as a staging area of construction vehicles and materials. While construction presents a challenge, St. Luke’s is agile! We have our plan in place and head into the season with excitement. During construction, our softball programs will have access to two on-campus facilities while also utilizing the nearby facilities of the Town of Lewisboro. Alternative options for the 2018 season are already being investigated. To make the next couple of seasons work, all of our spring programs will be sharing spaces, modeling a cooperative environment, and creating every opportunity for all teams to have fantastic experiences. Our field hockey program will have the expansive space of Watson Field (our stadium field) that will serve as the home for a majority of our field hockey activities in the fall. While an inconvenience to lose the Upper Field, playing more on artificial turf will be an opportunity for the program. The Athletic Department is constantly evaluating new options to best support all of our athletics programs. For questions about construction logistics or safety concerns please contact Julia Gabriele, Associate Head of School for Finance and Operations. For questions about fundraising or to make a donation to this project, please contact Ninette Enrique, Director of Development.